Between May 13 and May 23, 2013, I co-taught a study tour of Civil War battlefields with a colleague. While this was the sixth time I have offered this study tour for undergraduate students, I decided at the outset that I would use this opportunity to gather information about orchards on Civil War battlefields. I was aware of the “famous” peach orchard where many men died on the field at Gettysburg, and was aware of a few other references to battlefield orchards, but was surprised at the abundance of information I uncovered on the eleven day trip. 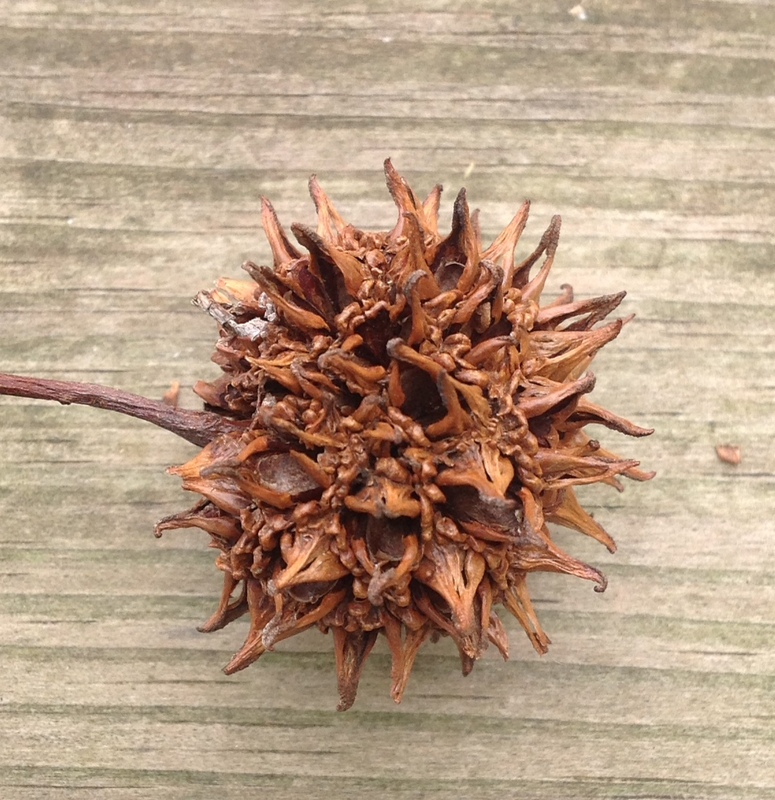 This is the fifth in a series of blog posts on orchards and the Civil War. The first time I encountered the Stonewall Jackson Apple it made sense to me. It was about six or eight years ago, on the last day of my biennial Civil War study tour, and we had already visited almost every Jackson shrine and monument Virginia had to offer. It was during the tour of Stonewall Jackson’s home in Lexington, Virginia, that a strange thought popped into my head: “This guy is a little bit like Johnny Appleseed.” The comparison, on the face of it, seems absurd. Stonewall Jackson was a fierce and unrelenting warrior, celebrated for his battlefield victories; Johnny Appleseed was remembered for his gentleness and his pacifism, and a respect for life that ran so deep he was loathe to kill even a mosquito. The two men were not even of the same generation. John Chapman was fifty years old and planting apple trees on the northern edge of the Ohio Valley when Thomas Jackson was born on its southern boundary in Clarksburg, (now West) Virginia. Both have been elevated to sainthood by people in their respective regions. But the similarity stops there. Maybe. This apple barrel stencil at the Belle Grove plantation is evidence of the commercial importance of apple growing on that Shenandoah Valley farm. 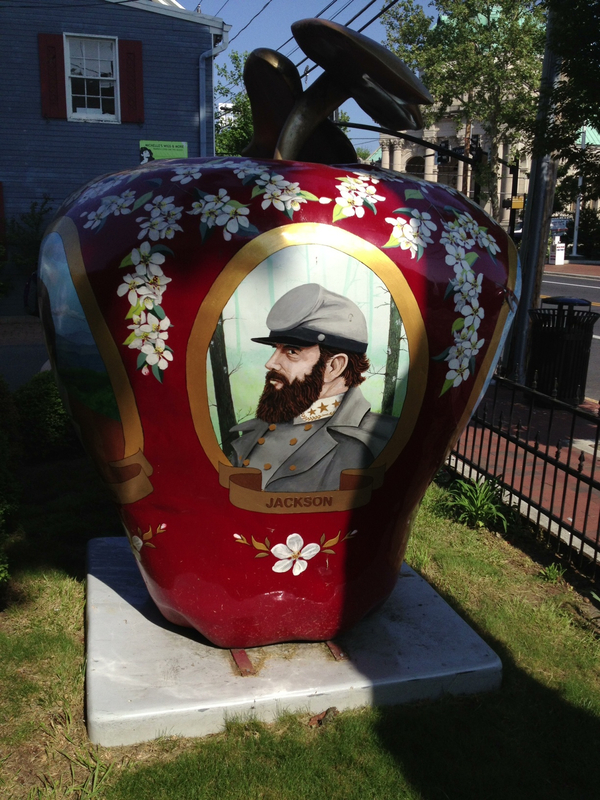 The Stonewall Jackson Apple can be found in Winchester, Virginia, at the lower (northern) end of the Shenandoah Valley. And the artist who painted Stonewall Jackson’s visage on a giant apple probably didn’t intend to make a Johnny Appleseed association. He was simply combining two things for which Winchester is known: Stonewall Jackson and apples. Jackson’s time in Winchester was brief, but it was at the height of his fame. 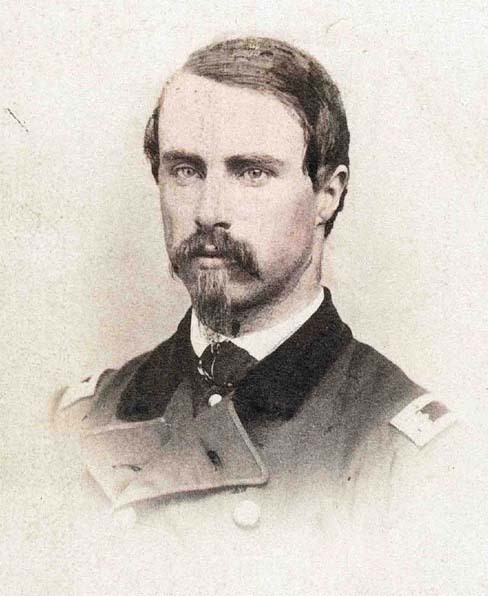 He used a home in Winchester as his headquarters in 1862, while he engineered a brilliant military campaign driving Union forces out of the Valley and threatening to bring the war into the North. That headquarters and brief residence is now one of Winchester’s more popular tourist destinations, and has been a regular stop on our Civil War study tour. Statue in front of the Johnny Appleseed Restaurant, New Market, VA.
Winchester’s association with the apple predates the Civil War. The Shenandoah Valley was Virginia’s richest apple-growing region in the mid-19th century, and while the Valley’s fertile fields earned it the nickname “The Breadbasket of the Confederacy” during the war, it might have also been called “The Orchard of the Confederacy,” because tree fruit was another very successful crop. 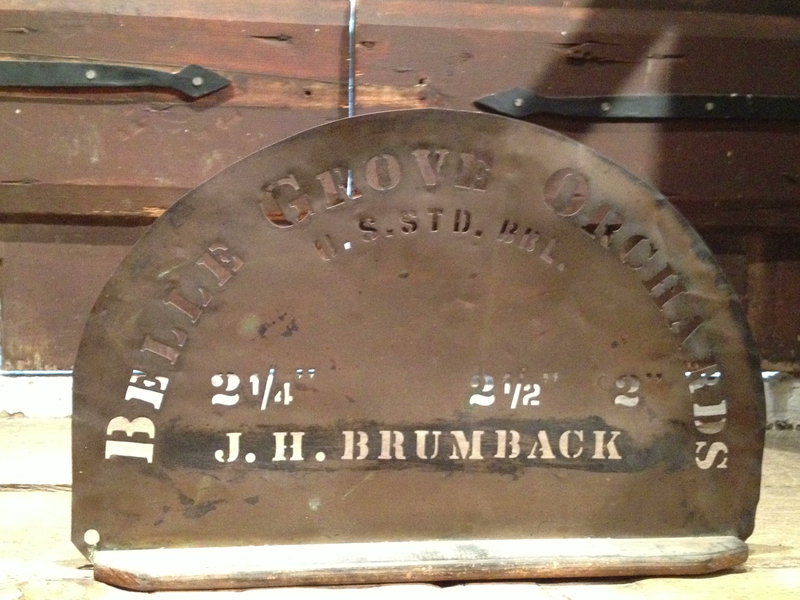 The Belle Grove Plantation, which sat in the middle of the Cedar Creek battlefield in 1864, has re-established a small heritage apple orchard and also has on display the apple barrel stencil used by Bell Grove’s planters in the 19th century. 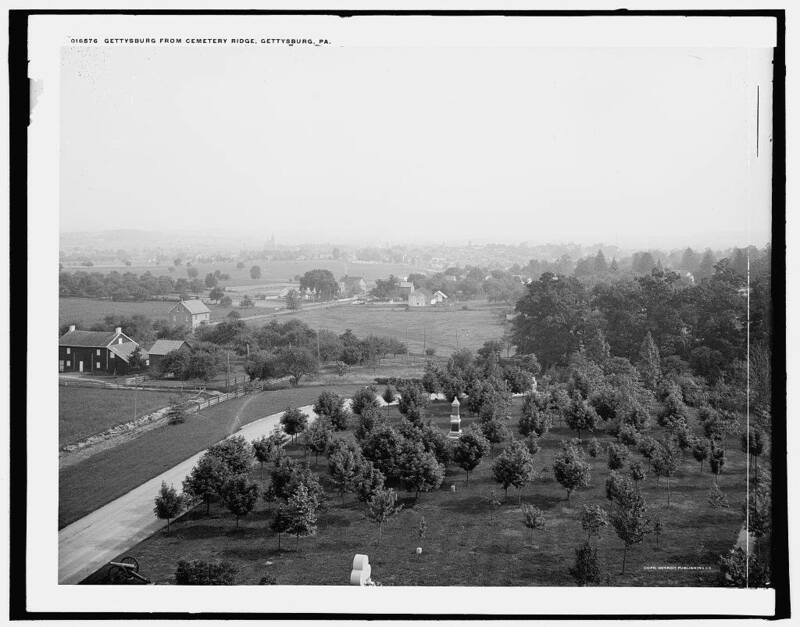 The Valley’s orchards were no doubt plundered by Sheridan’s marauding armies during the Fall of 1864, but they survived the war more or less in tact, and apples continued to be an important valley crop all through the next century. New Market, Virginia, further up the Valley still has a Johnny Appleseed Restaurant, and Winchester has been hosting an annual Apple Blossom Festival for about ninety years. 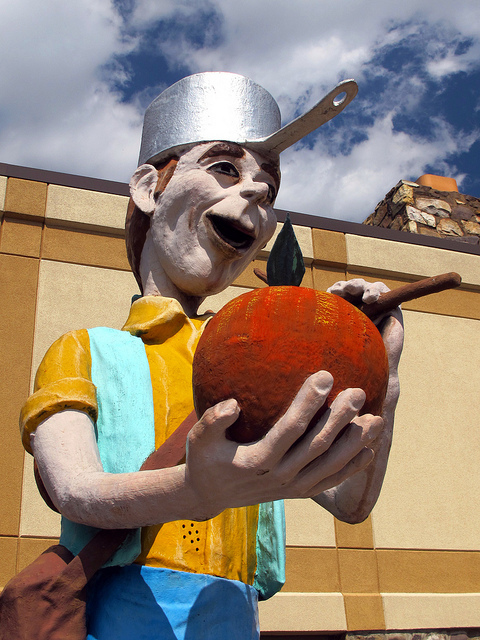 While there is no real evidence that John Chapman ever visited the Valley, like most of the nation’s apple-growing regions it nevertheless still has a few of its own Johnny Appleseed legends. The similarities I found between Stonewall and Appleseed had less to do with the actual men than with their myths. In my essay, “The Invention of Johnny Appleseed,” and also in my book, Johnny Appleseed and the American Orchard, I argue that the Johnny Appleseed legend largely took form during the Victorian era, and as a result reflects that era’s values and obsessions. So I was pleasantly surprised this year when we stopped at the Stonewall Jackson House in Lexington, Virginia and I stumbled across a fascinating and relatively new book by Wallace Hettle titled Inventing Stonewall Jackson. Hettle explores the myth of Stonewall from many angles, and I cannot do justice to his sophisticated and nuanced argument in this blog post. 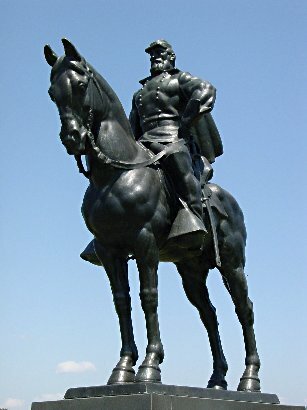 But Inventing Stonewall Jackson affirmed for me that some of the most prominent features of the Stonewall myth emerged in the Victorian era. 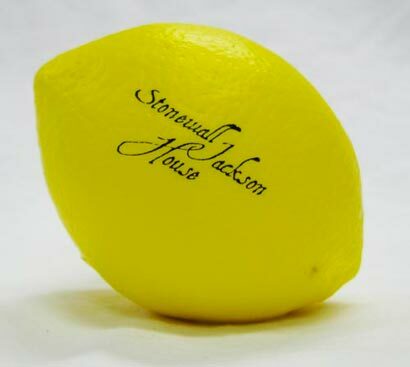 Stonewall Jackson foam stress-relieving lemons are available in the gift shop at his Lexington, VA home. Despite the profound differences in the way these two men lived, there are at least three prominent elements of their myths–each celebrated by Victorians–that Stonewall and Appleseed share: eccentricity, piety, and domesticity. Jackson’s penchant for sucking on lemons and holding one arm straight up in the air as he rode on his horse are two stories which are still told today, and Appleseed of course is remembered for his peculiar eating habits, dress, and penchant for going barefoot in even the worst weather. 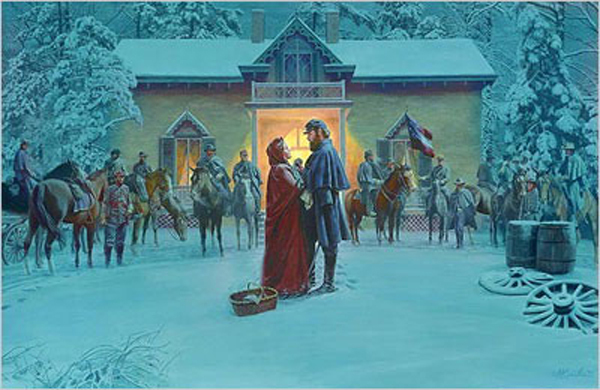 Popular Civil War Artist Mort Kunstler depicts a farewell scene with his beloved wife, in front of the Winchester home that served as his headquarters. Finally, despite the fact that Stonewall left his family to take up the sword, and Chapman was a life-long bachelor, the Victorian hagiographers of each man threaded domestic virtues into each man’s story. Stonewall, we are constantly reminded, was a devoted husband and had special affection for children. Appleseed shared that fondness for children and helped to sustain families by visiting their cabins and reading the Bible to attentive frontier families. The steroid-infused version of Jackson and his horse “Little Sorrel” on the Manassas Battlefield. Between May 13 and May 23, 2013, I co-taught a study tour of Civil War battlefields with a colleague. While this was the sixth time I have offered this study tour for undergraduate students, I decided at the outset that I would use this opportunity to gather information about orchards on Civil War battlefields. I was aware of the “famous” peach orchard where many men died on the field at Gettysburg, and was aware of a few other references to battlefield orchards, but was surprised at the abundance of information I uncovered on the eleven day trip. This is the first in a series of blog posts on battlefield orchards. Joseph Sherfy purchased land along the Emmitsburg Road, south of the town of Gettysburg, in 1842. Sherfy was a striver, and decades later his obituary declared that “he made out of sterile acres a most productive farm [and] deservedly stood in the front rank of intelligent and successful agriculturists.” Planting much of his land in peach trees, by the eve of the Civil War Joseph Sherfy’s peaches, which he sold fresh, dried, and canned, were locally famous, and his orchard appeared on an 1858 map of Adams county. The business supported Joseph, his wife Mary, and their six children. When the Union army reached Gettysburg on the first of July 1863, Joseph Sherfy and his family were ready to help, providing water and bread to thirsty and hungry soldiers. The next day they were forced to evacuate their home, and did not return until the battle was over. On days two and three of the battle, the Sherfy farm was in the midst of the conflict. A decision made by Union General Dan Sickles, against the orders of his commanding officer, ensured that Joseph Sherfy’s Peach Orchard would never be forgotten. Ordered to hold his men in a line that extended south of the town of Gettysburg to a hill called Little Round Top, Sickles’ decided instead to move his men forward to another spot of high ground in the middle of Sherfy’s orchard, a position he believed would be more defensible. By doing so, Sickles created a sharp bend in the line, a vulnerable “salient,” in the language of war, which could be attacked by the Confederate army from two sides. By the time Commanding General Meade realized what Sickles had done, easy retreat was not possible, and the soldiers in Sherfy’s Peach Orchard faced withering fire for several hours before those not killed were able to retreat. 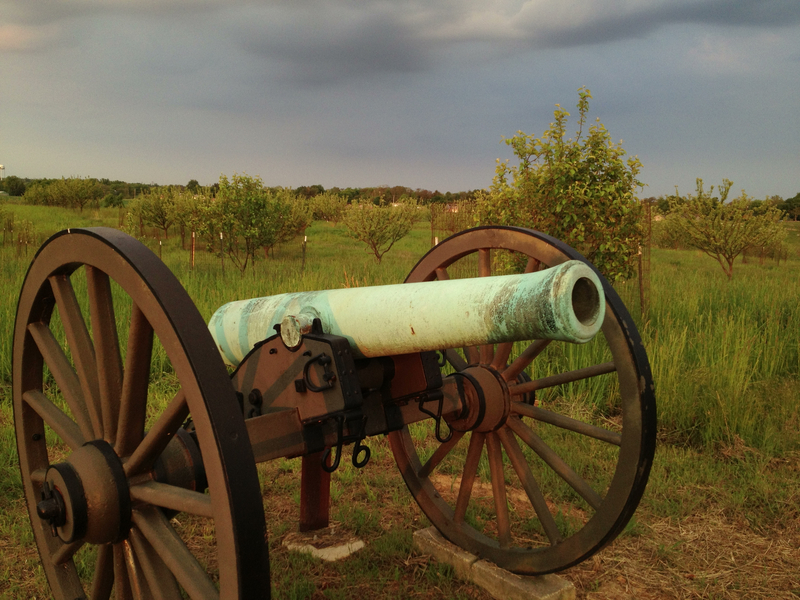 The fighting in and around the peach orchard salient is remembered as among the fiercest of the three day battle. One of the few surviving images of the original Sherfy orchard, in William A. Frassanito, Gettysburg, Then and Now: Touring the Battlefield with Old Photos, 1865-1889. What the Sherfy’s found when they returned to their home after the battle surely disheartened them. Their barn had been burnt to the ground, the exterior of their home was riddled with bullets, and the interior had been ransacked by Confederate soldiers. The soils in the orchard and elsewhere on the farm had been hastily dug up, with the corpses of soldiers buried wherever they had fallen, while forty-eight dead horses remained strewn about the orchard, swelling and decomposing in the summer heat. The Sherfy’s estimated their losses as $2500, but like most residents of the village, were awarded little or no compensation from the government. Yet the peach trees in the orchard where so many men and beasts fell, rattled by canister and rifle fire, mostly survived. In the ensuing years, Joseph Sherfy’s peach orchard became a popular stop with returning veterans and curious visitors. Veterans shared their stories with the Sherfy’s and Mary Sherfy collected pictures of these men, displaying them on a wall in her home. Veterans of the battle, as well as tourists, were eager to view and touch a large cherry tree which stood alongside the Sherfy home, which had a 12 pound ball lodged deep within its trunk. 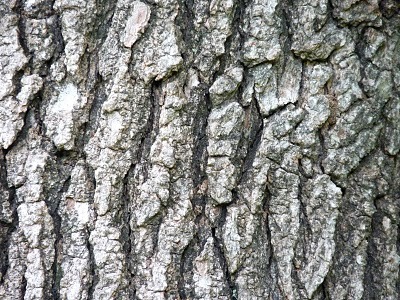 “Soldiers and veterans saw trees (and their fragments) . . . as objects that provided access to the past, a vital link to the landscape of war they had created,” Mary Kate Nelson reminds us in Ruin Nation, her fascinating study of the war’s aftermath. Before they departed, both veteran and tourist to the Sherfy farm took away with them a souvenir of another sort–canned or dried peaches from the Sherfy’s surviving orchard. 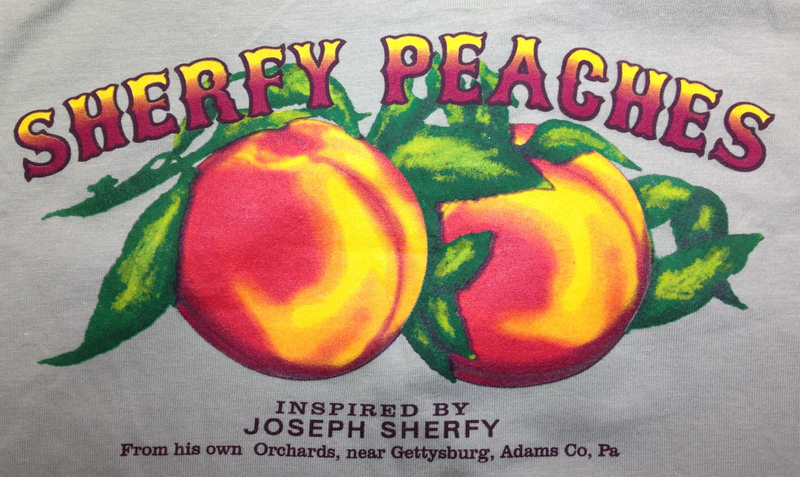 Joseph Sherfy died in 1881, but his famous peach orchard survived him, and drew more visitors with each passing year. Just when and why the Sherfy orchards was uprooted I do not yet know. But for decades, the land remembered for the bloody fighting at “the peach orchard,” contained no peach trees at all. T-shirts, peach taffy, and aprons, adorned with the Sherfy Peach Orchard logo, are now for sale at the Gettysburg Visitors Center. Between May 13 and May 23, 2013, I co-taught a study tour of Civil War battlefields with a colleague. While this was the sixth time I have offered this study tour for undergraduate students, I decided at the outset that I would use this opportunity to gather information about orchards on Civil War battlefields. I was aware of the “famous” peach orchard where many men died on the field at Gettysburg, and was aware of a few other references to battlefield orchards, but was surprised at the abundance of information I uncovered on the eleven day trip. This is the second in a series of blog posts on battlefield orchards. Chatham Manor today. Before the Civil War, this was the back of the house, with the front yard overlooking the Rappahannock. 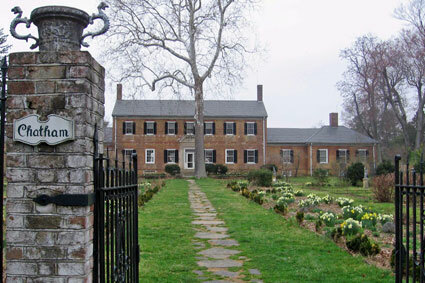 Chatham Manor sits on the north bank of the Rappahannock River, on a high bluff overlooking the City of Fredericksburg. It was built for entertaining Virginia’s elite. Its first owner, William Fitzhugh, was among that elite, and at different times both Washington and Jefferson were guests at the house. The 1280 acre plantation, surrounded by carefully-designed and managed gardens, two orchards, and fields of commercial crops, was designed to impress its guests with the wealth and refined tastes of its owner. We can imagine William Fitzhugh providing guests like Washington and Jefferson with a spectacular meal, perhaps one that ended with a dessert of fine and rare fruits from his orchards. And we can imagine the fruits of Chatham’s orchards being a subject of their conversation. Both Washington and Jefferson were immensely proud of their own carefully kept orchards of the fine fruit, acquired from nurseries on both sides of the Atlantic. Perhaps Fitzhugh and his guests promised to exchange grafts of especially rare varieties with each other, as members of this elite club were wont to do. 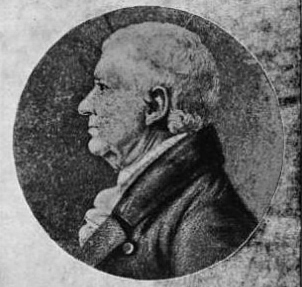 William Fitzhugh, member of the 2nd Continental Congress, builder of Chatham Manor. The Fitzhughs, Jeffersons, and Washingtons of Virginia could afford to devote time and resources to the hobby of fruit growing because they commanded the labor of hundreds of unfree persons. 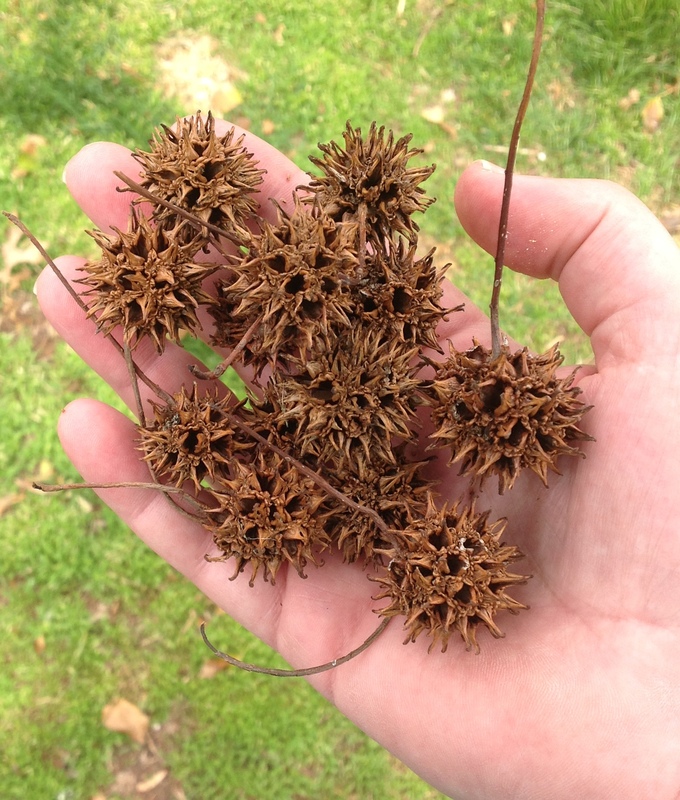 Slavery made Chatham’s fine gardens and orchards possible. Despite the efforts of Fitzhugh and other southern planters to present themselves to the world as benevolent patriarchs overseeing an Edenic and peaceable kingdom, the truth was that all of this wealth and refinement was derived from their exploitation of other people. In 1805, Fitzhugh’s slaves rose up in rebellion against their cruel treatment. An armed posse of white men put the rebellion down. Two of the rebels were killed as they tried to escape; another was captured and executed as a warning to others; two more were sold away to another plantation, probably in the West Indies. Fitzhugh, who had come to find both managing enslaved laborers and entertaining other elite Virginians a wearying task, sold Chatham the next year. 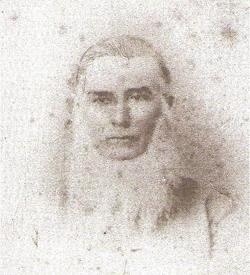 James Horace Lacey, owner of Chatham Manor, confederate staff officer. Its subsequent owners continued to operate Chatham manor as a plantation estate. 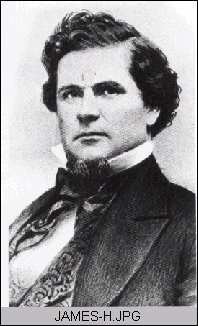 When southern states seceded in 1861, believing Lincoln’s election a threat to the institution of slavery, Chatham’s then thirty-seven year old owner, James Horace Lacy, followed his interests and joined the Confederate army as a staff officer. 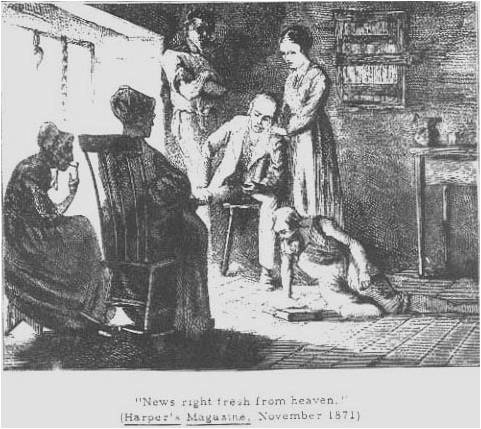 In April of 1862 when the Union Army occupied the north bank of the Rappahannock, Lacey’s wife and children fled to Fredericksburg on the south side of the river. In December of 1862, Union General Ambrose Burnside used Chatham as a command center. He hoped to launch a quick strike across the Rappahannock before Lee and his Army were prepared, then push on towards the Confederate capitol at Richmond. But when he arrived with his army on the north side of the Rappahannock, the pontoon boats he needed to build a bridge across the river had not. 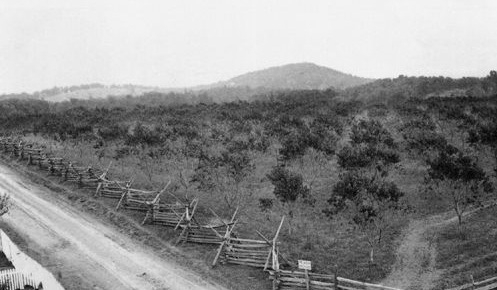 As Burnside waited, Lee and his army dug in, occupying a long imposing ridge just south of the city of Fredericksburg. The Sunken Road at Fredericksburg. Hundreds of Union soldiers fell trying to take this position. In the 19th century, it was customary for armies to suspend campaigns in winter. Most of the major battles of the Civil War occurred in the spring, summer or fall. But Lincoln, eager for a decisive victory before the Emancipation Proclamation came into effect on January 1, pushed Burnside to act. Burnside, too, was eager to demonstrate that he was different from the overly-cautious McClellan whom he had recently replaced. The result of this impatience was one of the costliest, most lop-sided Union defeats of the war. Union forces were able to make the crossing and take the town, but the assault on the Confederate position on Marye’s Heights, across open fields, was a terrible folly. 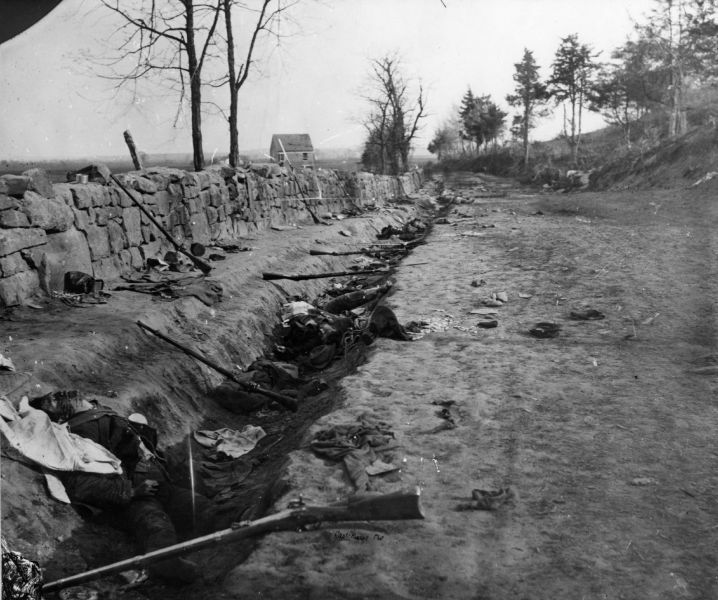 Confederate riflemen fired upon advancing Union soldiers from a sunken road at the base of the heights; Confederate artillery rained down upon the exposed soldiers from the heights. Burnside stubbornly persisted, sending fourteen separate charges against the entrenched Confederates, all of them costly failures. At the end of the day, Union casualties just in the Marye’s Heights section of the line, were six to eight thousand, while Confederates lost less than a quarter of that many. After the battle, Chatham Manor was converted from Union Command Center to field hospital. Hundreds of wounded and dying men faced triage and amputation in tents set up on its grounds, many of those who did not survive were temporarily buried in Chatham’s gardens. 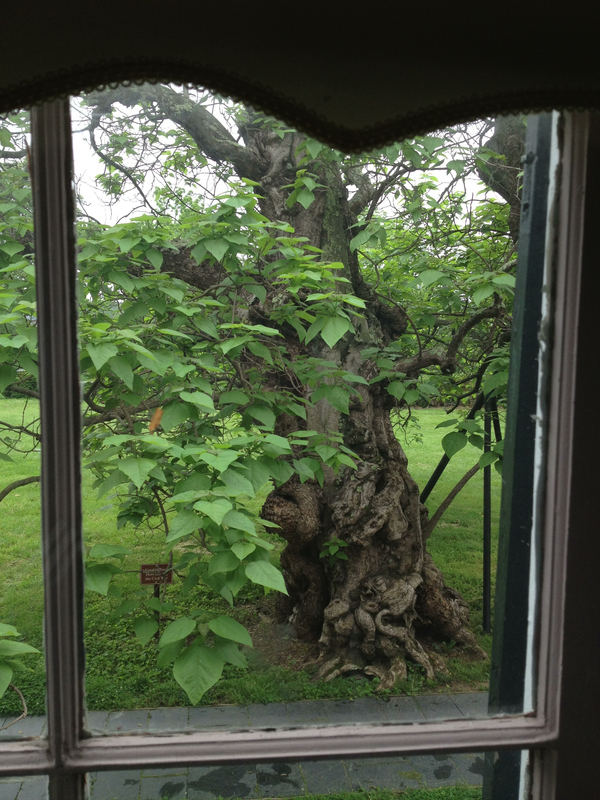 Whitman’s catalpa tree from a parlor in Chatham Manor. The catalpa tree which sheltered the pile of unsalvageable appendages survives, and is visible from that window. 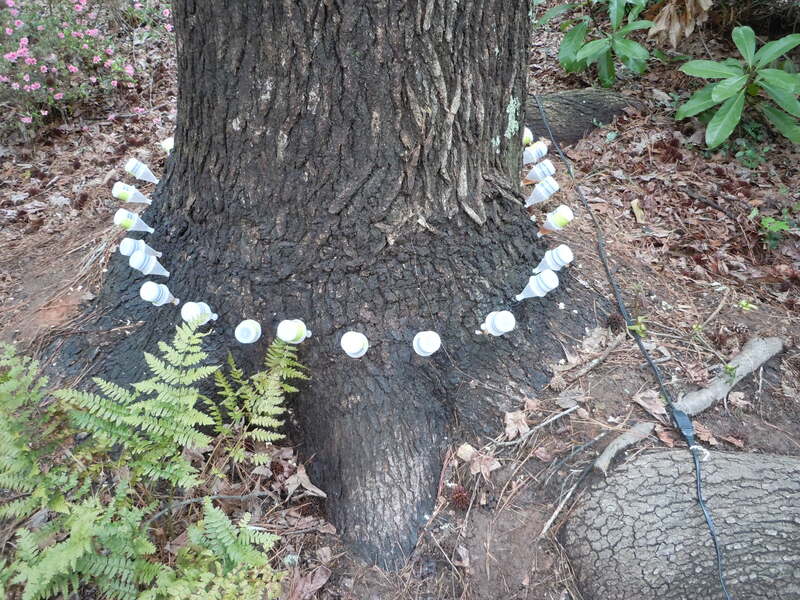 Its bark more gnarled and knotted with age, and its aging trunk and some of its heavier branches now held up with steel supports, in a heroic effort to preserve the last witness to this terrible scene. It is as if this old catalpa has become Whitman himself, pointing at the precise spot of the carnage, telling us not to look away. While Whitman’s catalpa tree survives, the orchards of Chatham Manor, a symbol of the luxury that slavery provided to an elite group of white men, do not. After the battle the Union army hunkered down for the winter on the north side of the river. On January 1, Lincoln’s Emancipation Proclamation went into effect, and the Rappahannock became one of the most important boundaries between slavery and freedom. Throughout that winter Virginia slaves stole themselves and gained their freedom by crossing to the Union side. Many stayed with the Union camp, and took jobs with the army. Soldiers and freedmen scoured the countryside that winter, seeking fuel to keep them warm. By spring the north shore of the Rappahannock was mostly denuded of trees, save Whitman’s Catalpa and a few other mature trees that graced the lawn of Chatham Manor. Chatham’s two orchards were no doubt among the first targets of the fuel foragers. When I asked the park rangers on duty at Chatham if they could point me to the original location of these orchards, they could not. The opulent orchards of Chatham, created by slavery, were ultimately extirpated by the soldiers and freedmen who brought about slavery’s demise. 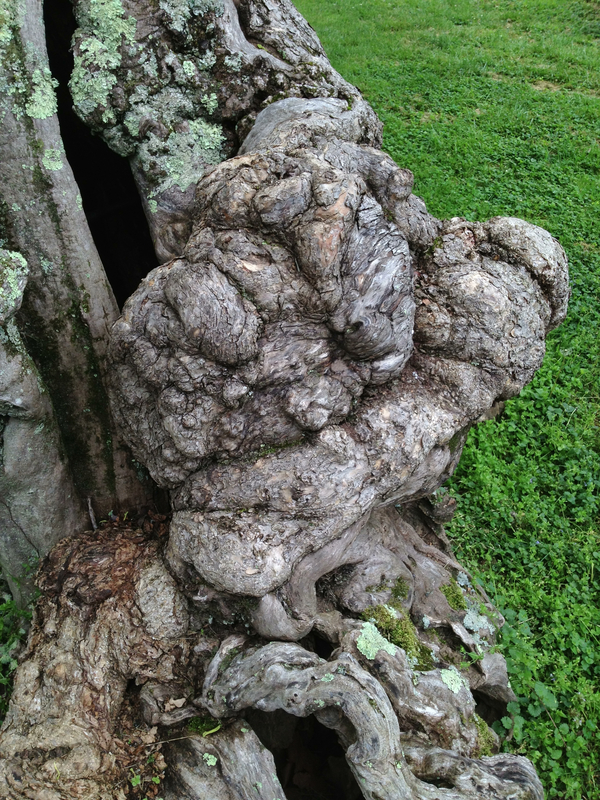 The gnarled, knotted bark of one of the last witnesses of the Battle of Fredericksburg. Between May 13 and May 23, 2013, I co-taught a study tour of Civil War battlefields with a colleague. While this was the sixth time I have offered this study tour for undergraduate students, I decided at the outset that I would use this opportunity to gather information about orchards on Civil War battlefields. 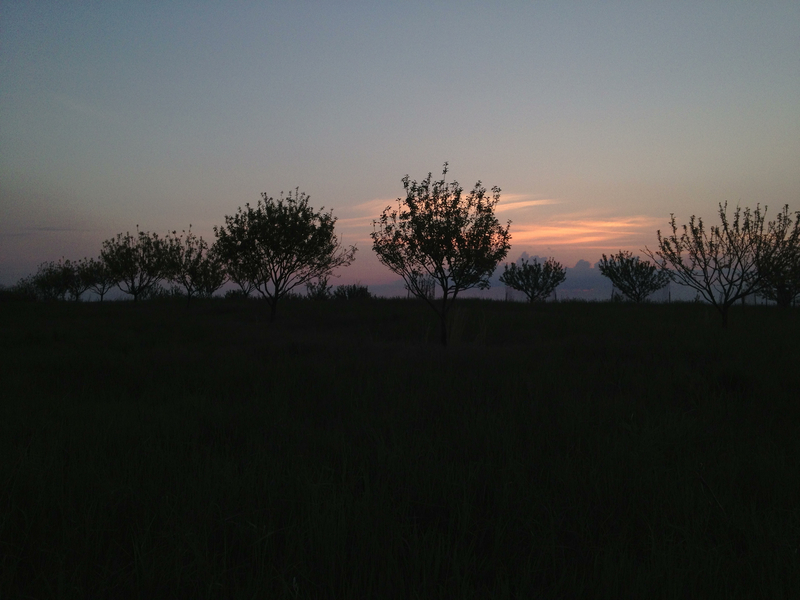 I was aware of the “famous” peach orchard where many men died on the field at Gettysburg, and was aware of a few other references to battlefield orchards, but was surprised at the abundance of information I uncovered on the eleven day trip. This is the third in a series of blog posts on battlefield orchards. An Army marches on its stomach.” This old adage, commonly attributed to Napoleon, was certainly one every Union and Confederate soldier understood. Soldiers spent a great deal of time thinking about their stomachs: what last went into them, and what might next go into them. Even when rations were plentiful, they were nonetheless dependably monotonous—salt pork, hard tack, and desiccated vegetables were standard fare. When opportunities arose to satisfy their stomachs with something different, soldiers could go to extraordinary lengths to seize them. This truth was perhaps no more dramatically demonstrated than at Sharpsburg, Maryland in the Fall of 1862, on the bloodiest single day of the war. The battle of Antietam has long been remembered for the fierce fighting which occurred in the cornfield, the West Woods, along Bloody Lane, and at Burnside’s Bridge, but actions that day in the Piper Orchard were also worthy of commemoration. 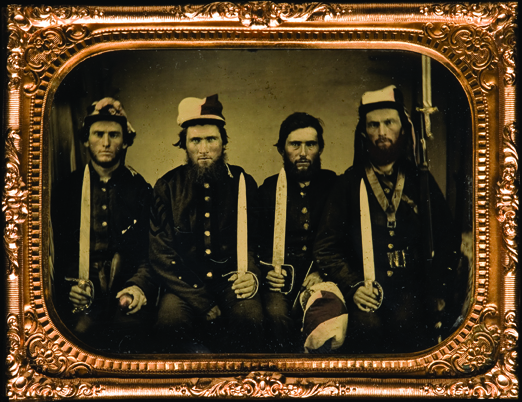 Four fierce-looking members of the 22nd Georgia. Some believe the object in the hand of the soldier on the left is a confederate grenade, but I’d like to think it’s actually an apple. The Piper apple orchard sat on a hill just south of the Sunken Road, where on the morning of the battle Confederate forces were entrenched in what appeared to be an impregnable defensive position. But once flanked by Union forces, the Sunken Road quickly became a death pit now memorialized as Bloody Lane. To the South of the Sunken Road on a hillside resided the Piper cornfield and orchard, and it was to this ground that Robert E. Lee sent a division of 4,000 men in an effort to rescue their trapped comrades. While this high ground allowed the Confederates to fire upon Union forces north and west of the Sunken Road, it also left the soldiers in that orchard terribly exposed to both Union artillery and rifle fire. Caught at the highest, most exposed part of the orchard, Georgia’s 22nd Infantry hunkered down, as minie balls flew over their heads and canister shot rattled the apple trees around them. Private W.B. Judkins, a member of that Georgia regiment recalled “the company was in the thick of the fight there in the apple orchard and cornfield. The ground was covered with apples where we fought, shot off the trees.” Judkins himself was wounded by schrapnel, but he and his fellow Georgians wasted no opportunity and instinctively grabbed as many fallen apples as they could. Major Thomas Hyde, whose 7th Maine suffered more than 50% casualties in the Piper Orchard that day. 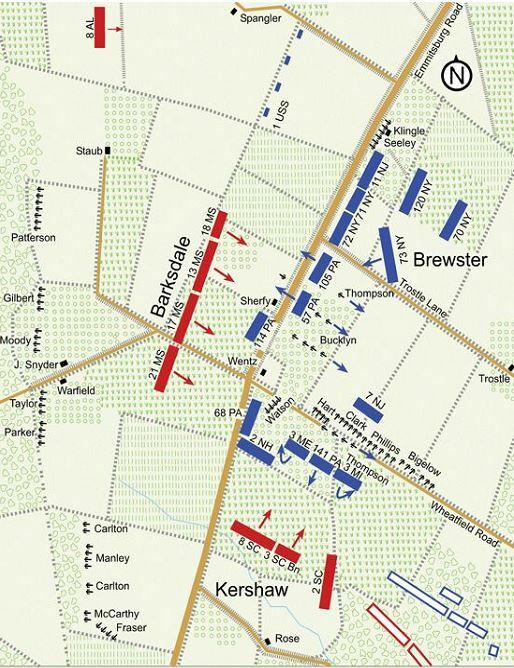 Later that afternoon, the focus of the battle shifted south to Burnside’s Bridge, but the scene near Bloody Lane and the Piper Orchard was far from peaceful. Confederates continued to use the high ground of the Piper farm and orchard to fire upon Union forces now firmly in control of the area around Bloody Lane. At this point, seizing the high ground of the Piper Orchard had no strategic importance, so Major Thomas Hyde was a bit shocked to receive orders from Colonel William Irwin to send his 7th Maine regiment—diminished by earlier fights to only about 200 men—to take the Piper Orchard from a Confederate force at least four times as large. The Maine men did so, but soon found themselves pinned down in the hilltop orchard, with no support coming from other regiments behind them. Thomas Hyde remembered “how the twigs and branches of the apple-trees were being cut off by musket balls and were dropping in a shower.” Another member of the regiment recalled how “bullets, men and apples were dropping on all sides.” Nonetheless, in a fight so fierce that Captain John B. Cook declared it was in the Piper orchard that he “learned how thickly bullets could fly,” the fearless and hungry men of the 7th Maine were reaching up into the branches of the trees to gather apples. 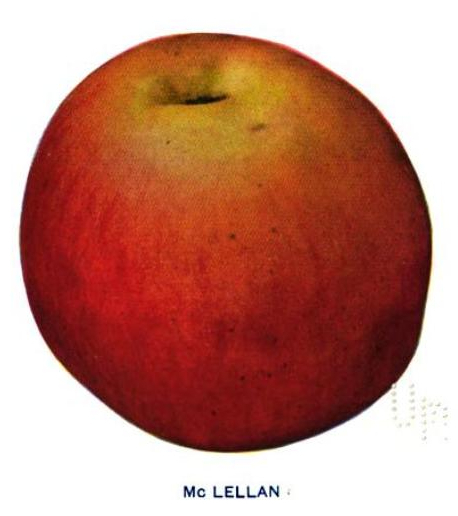 When the fighting finally ended that evening, more than one in three of Georgia’s apple-gathering soldiers were casualties, while Maine’s second-harvesters lost more than half their regiment. One of the heritage varieties planted in the new Piper Orchard was the McLellan, which has no connection to the Union’s Commanding General at Antietam, George McClellan. Image from S.A. Beech, Apples of New York. The Piper Orchard at Antietam, like the Sherfy Orchard at Gettysburg, survived the war but not the century. When the Congress acquired the battlefield at Antietam and established a national park, there were no more apple trees on Piper hill. In 2002, as part of a wider effort to restore National Battlefields to their pre-battle landscapes, Antietam National Battlefield replanted 6.5 acres in apple trees, selecting 19th century varieties; five years later, they planted an additional 13.5 acres, this time including some modern disease-resistant varieties. Protecting the young orchard from the ravages of deer has been a challenge, and today about half of the trees in the orchard are surrounded by sturdy deer-proof fencing. Slowly but surely, the Piper Orchard is returning to something looking a bit like its 1862 appearance. A detailed description of the 7th Maine’s fateful charge into the orchard can be found here. For a thrilling description of the entire battle, including the experience of the Georgia 22nd in the Piper Orchard, pick up Richard Slotkin’s The Long Road to Antietam. More about the efforts of Antietam staff and volunteers to restore the Piper Orchard can be found here and and also at the Save Historic Antietam Foundation website. Excellent, detailed maps of the entire battlefield, including the locations of the Piper and other orchards can be found in Bradley Gottfried’s The Maps of Antietam. 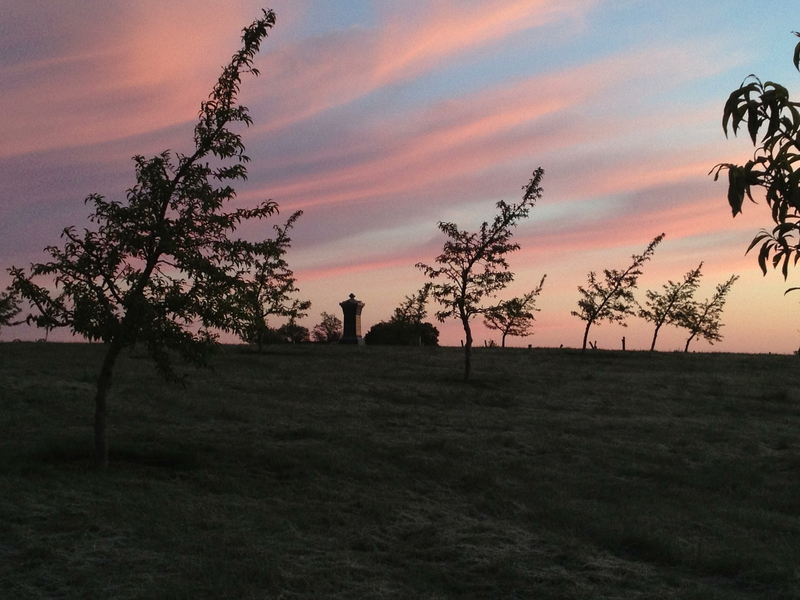 The new Piper Orchard at dawn, May 2013.